Old Zinfandel vines in Lodi. One of my very early jobs was working for the late Geoffrey Roberts who was an early champion of the wines of California and Australia in the UK. As a consequence I had opportunities to taste some amazing California wine while at a young and impressionable age. As a consequence I have loved California wines pretty much all my working life. Therefore it pains me that it is so hard to enjoy California wines here in the UK. Yes, there are huge amounts of very everyday stuff that is barely worth drinking – you know the brands, while the fabulous wines that gave California its fame tend to be ludicrously expensive once they arrive in the UK – actually in the US too come to think of it. So while it is always a struggle to feed my love of California wine, there are some high quality bargains out there. I was fortunate enough to taste one the other day and I enjoyed it so much and it is so delicious – and perfect for the icy weather we are having right now – that I have made it my Wine of the Week. 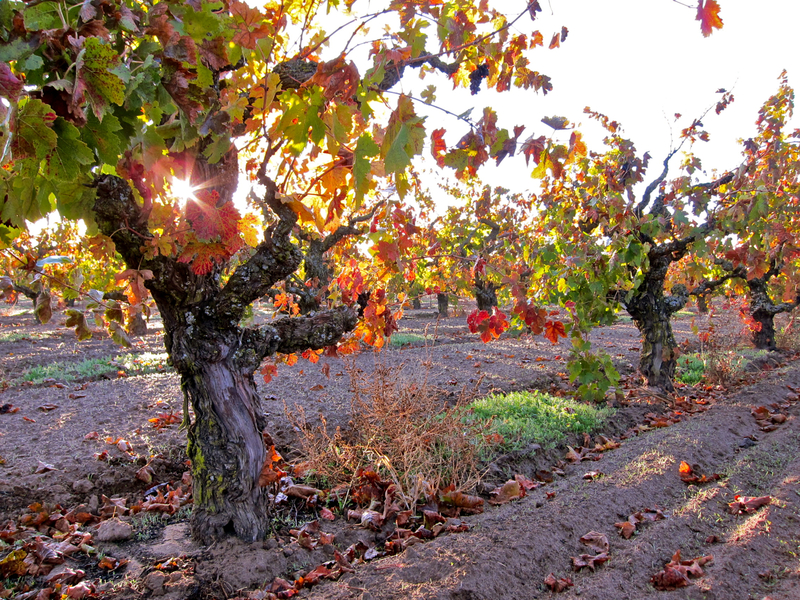 As far as we can tell, the grape that became Zinfandel was taken to the eastern United States from Europe in the 1820’s – long before the annexation of California. Records show that it was taken from the Austrian Imperial nursery in Vienna to Boston and was originally sold as a table grape in New England, but destiny called when cuttings were shipped to California to take advantage of the boom caused by the Gold Rush in 1849. That was all we knew until the 1990s when DNA testing discovered that Zinfandel was identical to the Primitivo that is widely used in Puglia, the heel of Italy. Further investigation and DNA work then discovered that Primitivo/Zinfandel were one of the parents of the Plavac Mali grape which is used on Croatia’s Dalmation coast. The other parent was Dobričić, an incredibly obscure Croatian grape that only grows on the Dalmatian island of Šolta. This find narrowed the search down and in 2001 a vine that matched Zinfandel’s DNA was discovered in a single vineyard in Kaštel Novi north west of Split on the Croatian coast. The vine was known as Crljenak Kaštelanski, or ‘the red grape of Kaštela’. In 2011 the researchers discovered another match, this time with a grape called Tribidrag which is also used on the Dalmatian coast. Crljenak Kaštelanski and Tribidrag are as alike as different clones of Pinot Noir, or Tempranillo and Tinto Fino, but Tribidrag is the more common name, although not much of it is left, so it too is obscure. However, records show the name has been used since at least 1518 and what’s more, Primitivo derives from the Latin for early, while Tribidrag derives from the Croatian for early – they are both early ripening grapes. 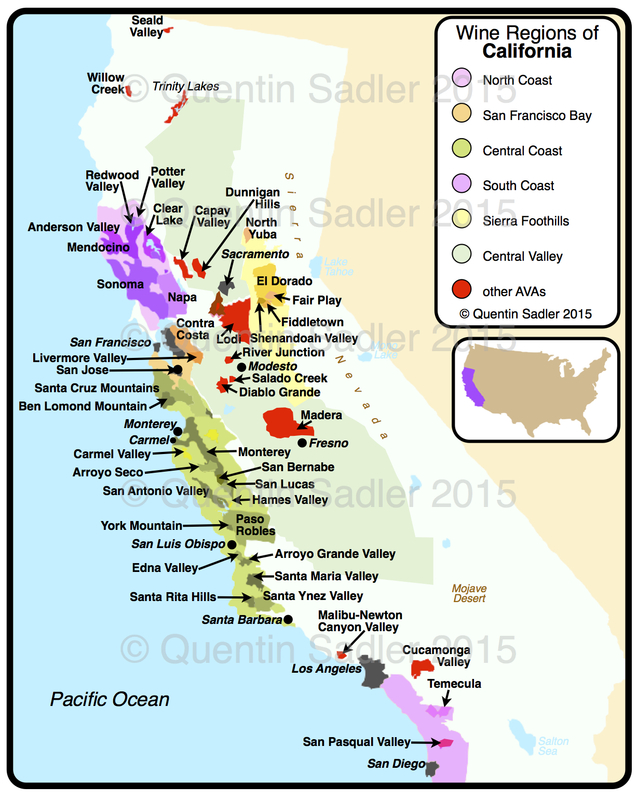 Wine map of California – Lodi is near Sacramento and due east of San Francisco. I have long been an admirer of what Delicato do. They seem to produce a wide range of really well made, classic California wines with plump, ripe fruit and lots of character – not to mention charm. They have been in California for well over 100 years, since Gaspare Indelicato arrive from Sicily looking for a better life. It seems the family had grown grapes and made wine in the old country, so he and and his three sons established a vineyard and winery in Lodi in California’s Central Valley. Today the third generation of the family run the business and they now have vineyards in Napa Valley and Monterey as well as Clay Station, their 526 hectare estate in Lodi. 100 year old Zinfandel in Soucie Vineyard, Lodi. Credit: Randy Caparoso. Many Italian families, including the Indelicatos, settled in this area which has a Mediterranean climate and sandy soils not unlike those found in many parts of southern Italy. Zinfandel was already grown here and as it has many Italianate characters would have made them feel right at home. Brazin is all about harnessing the rich fruit character of this hot region and producing a rich, plush and powerful wine. Much of the fruit is bought in from small growers with whom the family have had contracts for generations. 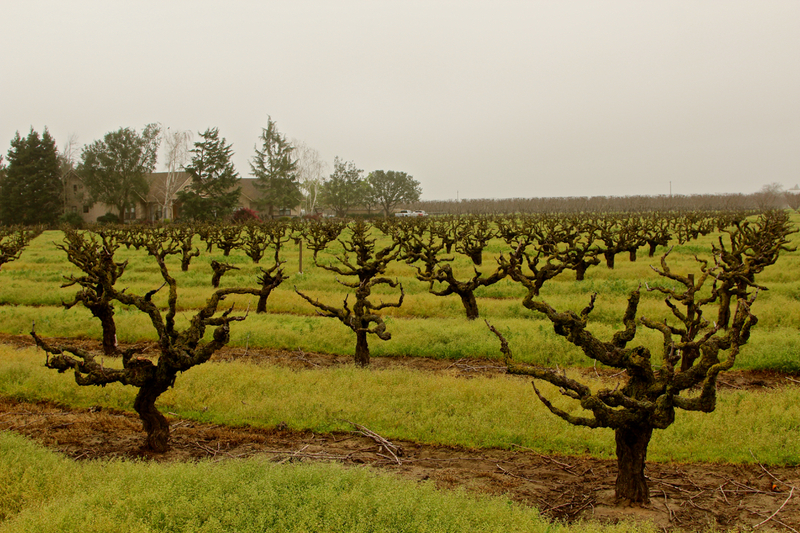 The vines are all 40 years old at least – often well over 100 – and old vines really suit Zinfandel. Old vines produce smaller crops with smaller berries and more intense flavours. They also reach full ripeness with lower sugar levels than younger vine – a virtuous circle. The vines are un-grafted and dry-farmed, which again ensures a small and concentrated cop, and head trained in the traditional Californian manner, rather than trellis grown. The soils are sandy and silty. 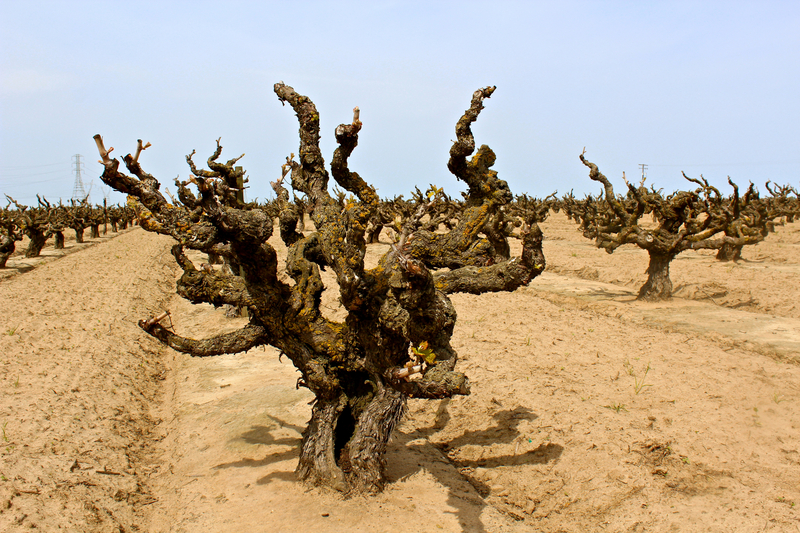 Old head-trained vines in Lodi. They want the wine to have rich, bold fruit and so cold ferment in stainless steel, but they also want it to be layered and complex, so age it in a mixture of French – for dry spice – and American – for sweet vanilla – barrels for 8 months. Everything about this wine screams rich and powerful – bold even, hence the joke on the label. It is opaque, like squished blackberries. The nose gives dense black fruit, spice, mocha, a little prune and raisin, pepper, sweet vanilla, red earth and bitter chocolate. The palate is sumptuous, bright, glossy, mouth-filling, mouth-coating and very tasty. There is a sweetness of rich dark plums, blackberries, blueberries, cassis all lightened by a hint of rich raspberry too. There is a little cooked fruit and dried fruit characters too and the whole thing is just a little bit jammy – in a really good way. Along for the ride there are coffee, cinnamon, vanilla, clove, dark chocolate, liquorice and black pepper flavours while there are supple tannins and enough acidity to balance the whole shebang. It is tasty, balanced – it carries its 14.5% alcohol very well, really enjoyable and sinfully easy to drink – 88/100 points. A lovely big red wine that will partner all manner of foods, burgers, steaks and barbecues for instance, but in the snowy winter conditions that we have right now in the UK I think it would bee great with a steak and kidney pudding, meat pie, beef stew or other hearty, warming dishes. Zinfandel is also really good with crispy aromatic duck! Available in the UK for £12.50 – £14 per bottle from Waitrose, Waitrose Cellar and The Wine Society.